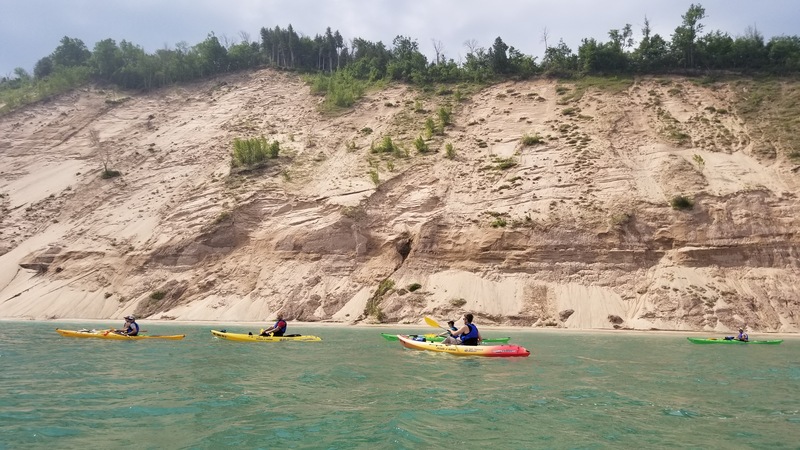 This new guided kayak tour around Pyramid Point was only authorized by the National Park Service in June 2018. Pyramid Point is in the distance. It is a beautiful tree-lined shore to the point. It starts at a parking area in Glen Arbor. The total time is over five hours. Total time on the water is over four hours. We shuttle you to Sunset Shores Drive where we start the guided kayak tour. 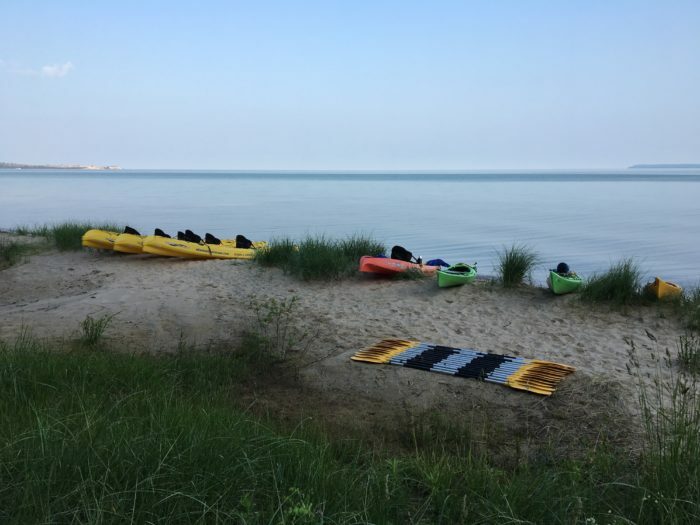 We expect to have you in the kayaks and on the water as close to 9:00 am as possible (4:45 pm for evening tours). The group paddles to the base of the dune at Pyramid Point. This is approximately three and a half miles. 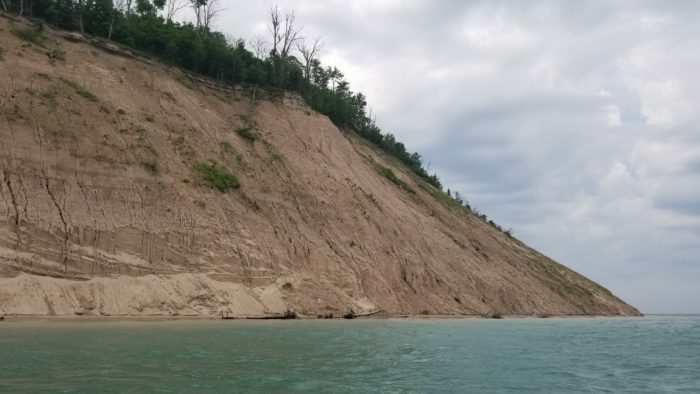 Pyramid Point is 260’ high. Sometimes there is a way to climb part of the way, but sometimes it is such a clay-based wall face that climbing is not possible. After a stop for your water and snacks, the group continues to Shalda Creek on Good Harbor Bay. This is just over two and a half miles. Lake Michigan seems to have many moods. We shuttle you back to the parking area in Glen Arbor. We expect to have you back to your vehicle between 1:30 pm and 2:00 (8:30 and 9:00 pm for evening tours). The bare face of clay and sand is quite a contrast to the beautiful forest along so much of the shore. Please note several things about this trip: there is limited availability and the cost is higher because of the logistics of guests, vehicles, trailers, and equipment at both the put in and a different vehicle and trailer set at the take out. Please make sure your reservation is for the trip you intended. We will only proceed with this trip if the wind is from the south half of the compass- southwest, south, or southeast or very mild from the north. The distance involved is too great with a strong wind from the north half of the compass. 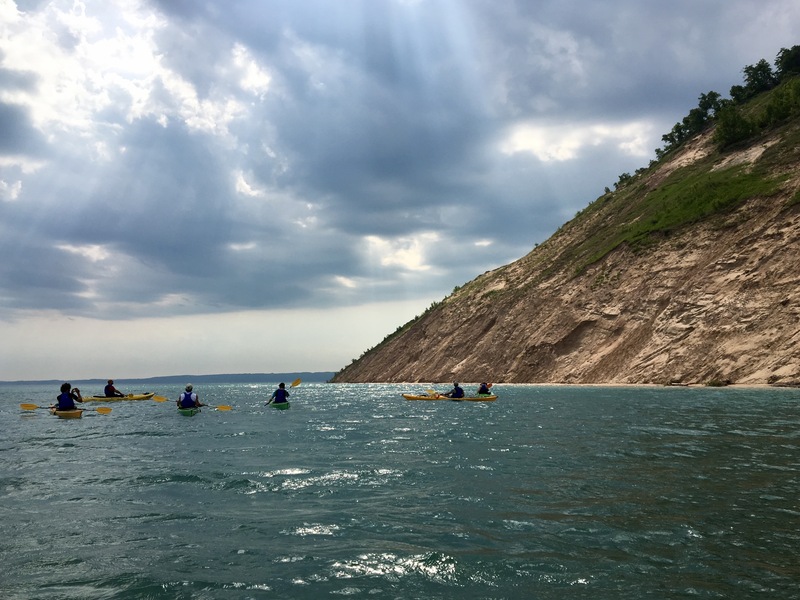 If the conditions are not right, we may switch to the original tour from North Bar Lake to the base of the Pierce Stocking Scenic Overlook; we would refund to you the difference in cost between the two trips. If you do not want to make that trip we will try to reschedule you to another day, or we will refund 95% of your charges. Our inaugural trip around Pyramid Point. 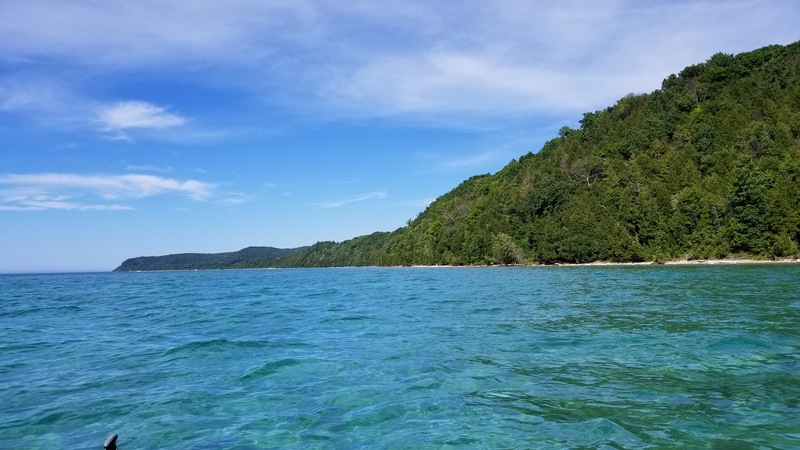 Sleeping Bear Point is to the left in this image and South Manitou Island is to the right. It was serene. We do not currently have pre-scheduled trips on this route to book. We are booking this route based on specific requests to accommodate as many as possible. Please email or text with the date you want and the number of people in your party. We will do our best to make this possible. Thank you! Be at 5998 West River Road (M-22), Glen Arbor at 8:20. We expect to return you there between 1:30 and 2:00. Be at 5998 West River Road (M-22), Glen Arbor at 4:00 p.m. Please note that this is not described or marketed as a “sunset” type cruise. We expect to have you off the water before the sunset.